Effortless elegance, vivacious atmosphere and of course fabulous but unpretentious food is what makes most of us feel the amare (love) for Italy. And somehow Mele e Pere has managed to condense all these things into one rather stylish eatery tucked away in Soho. The Italian trattoria has just celebrated its first birthday and if things continue as they have there’ll be many more of these to come and I’m happy to feast every year there too! I’d come for a relaxing catch up with one of my closest friends who can talk almost as much as me, which basically means we were in for a long night – and with a menu (and staff) that allow your meal to be etched out over four hours it was the perfect setting. Metal brick walls adorned with posters reassure you this is a place to feel at ease and a menu to take your time over. The service was really good, no matter how long we took over the bread basket for our initial story swapping the staff were patient and helpful and as hot as an Italian summer, a sideline but still a bonus on a girls night. Take things slowly, if like us you’re never the first to leave the party, order a cocktail or glass of Prosecco, what else? 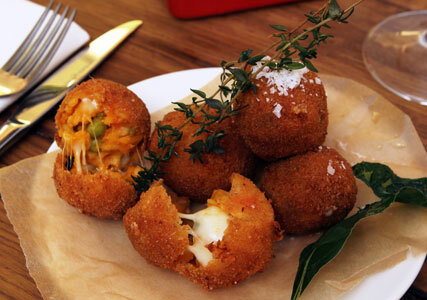 With classic dishes sitting aside more modern finds we tucked straight into a selection of Italian tapas enjoying delicious arancinic £5, bucantini all’ Amatriciana (with the pasta made inhouse), £8 and braised lamb meatballs, £5.50. Our mains didn’t disappoint, we both opted for meat dishes, our stomachs were given plenty of breathing space between course which was welcomed. I had Angus beef fillet with wild mushrooms and rosemary jus £25, I think this was the only time I stayed quiet that evening – it’s a cliché but I was too busy concentrating on the delicious food to talk. My friend enjoyed Surrey farm reared pork chop with marinated radiccho of Treviso, £16.50 – she also was delighted. Our sides of home made chips and a wild rocket and parmesan salad, £3.50 each, weren’t really required but were still enjoyed. I still don’t know how anyone can go to an Italian restaurant and not finish things off with ice cream, but my friend, despite my persuasion, really enjoyed her Orange cake, goat’s ricotta cream and clementine sorbet, £6 while I finished things off with silky smooth peanut butter ice cream – perfection. We were the last ones left in the restaurant, testimony to the fact we talked way too much, but also that the food was incredible and the setting so welcoming we could have pretty much moved in.